Some youth belonging to the Andani and the Abudu gates in the Dagbon chieftaincy dispute yesterday traded missiles at the premises of the Accra High court where the trial of the suspected killers of Ya Na Yakubu Andani II, who was murdered in 2002, started. Casualties were recorded from both sides of the divide. Fifteen persons believed to belong to the Abudu gate are standing trial for their alleged involvement in the murder of the Ya Na. The trial officially commenced yesterday when the new judge, Justice E.K. Ayebi of the Court of Appeal took his seat. Justice Anthony Oppong who was initially assigned the case had to recuse himself after receiving what the judge described as “useless propaganda” from the Deputy Attorney-General who accused him of bias. But for the timely intervention of the Greater Accra Regional Police Command, the two groups would have re-enacted what happened in Yendi in 2002. During the court proceedings, some of the youth started attacking their opponents with deadly weapons such as iron rods and machetes just outside the court yard and along the High Street, leaving five Abudus and one Andani injured severely. The police had to transport the injured to the hospital. For about one-and-a-half hours, the police, who were later joined by their Regional Commander DCOP Rose Bio-Atinga, had a torrid time pushing the rampaging youth back into the streets and had to bring more men to control the situation. At a point, those said to belong to the Abudus were kept inside the court yard while their Andani counterparts positioned themselves outside and were seen shouting and beckoning them for a fight while the police stood between the two feuding parties. In the process, those outside the court walls started throwing stones into the direction of the Abudus who were in the court yard and the police quickly moved in, arresting two men. The second suspect believed to be from Ashiaman, who was arrested had talisman around his body and the police could only pushed him into a waiting van when the talisman was removed. However, the police did not fire a single bullet or tears gas as they were very careful with their approach. When approached for her comments, DCOP Bio-Atinga said she had nothing to say except to add “please depend on what you saw”. In the court, Justice Ayirebi had to adjourn proceedings until tomorrow, Thursday September 9, 2010 because the Dagbani interpreter could not interpret to the satisfaction of the accused persons; 10 of whom said they would prefer the proceedings to be conducted in Dagbani. All 15 accused persons, except Zakaria Yakubu aka Zakaria Forest, the seventh suspect who is currently at large, were in court. 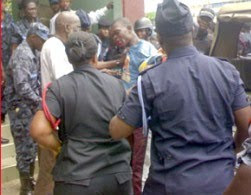 They all pleaded not guilty to two counts of conspiracy and murder and were remanded into police custody by the court. The judge has already ordered the court registrar to procure a Dagbani interpreter for the trial and the seven jurors for the trial have also been named. Those on trial are Iddrisu Iddi aka Mbadugu, Alhaji Baba Abdulai Iddrisu aka Zohe, Kwame Alhassan aka Achiri, Mohamadu Abdulai aka Samasama, Sayibu Mohammed, Alhassan Braimah and Alhaji Mohammed Habib Tijani, 45, former District Chief Executive of Yendi during the NPP regime as 2nd, 3rd, 4th, 5th, 6th and 8th accused persons respectively. The rest are Baba Ibrahim aka Baba Zey, Alhassan Mohammed aka Mohammed Cheampon, Mohammed Mustapha, Shani Imoro, Yakubu Yusif aka Leftee and Hammed Abukari Yussif and Abdul Razak Yussif aka Nyaa as 9th, 10th, 11th, 12th, 13th, 14th and 15th accused respectively.